Cobb Branden and the townsfolk reveal to Lois that they've been protecting and nurturing Jon since they first arrived in Hamilton County. Jon meanwhile is being forced by his captor to watch his parents, unable to escape his prison of black mirrors. Lois refuses to give in and fights back against the townsfolk but when they too turn aggressive, Superman is forced to leave the prisoners where they are to rescue Lois. 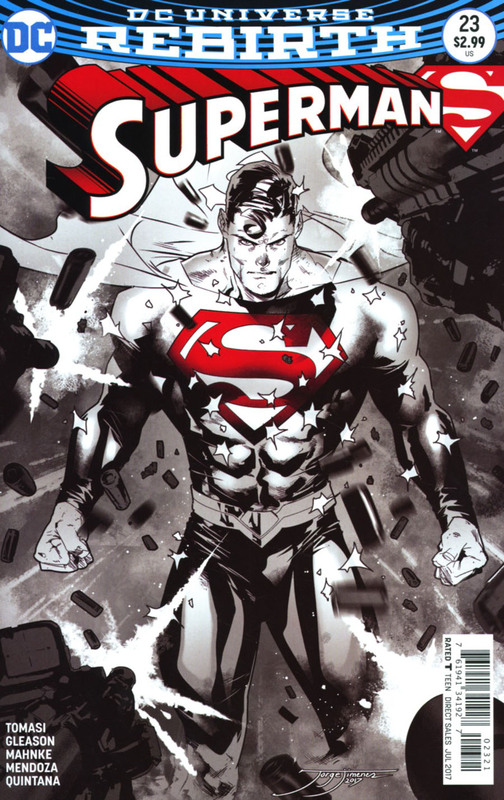 Superman and Lois are a force to be reckoned with but each time they are injured a terrified Jon is forced to watch. 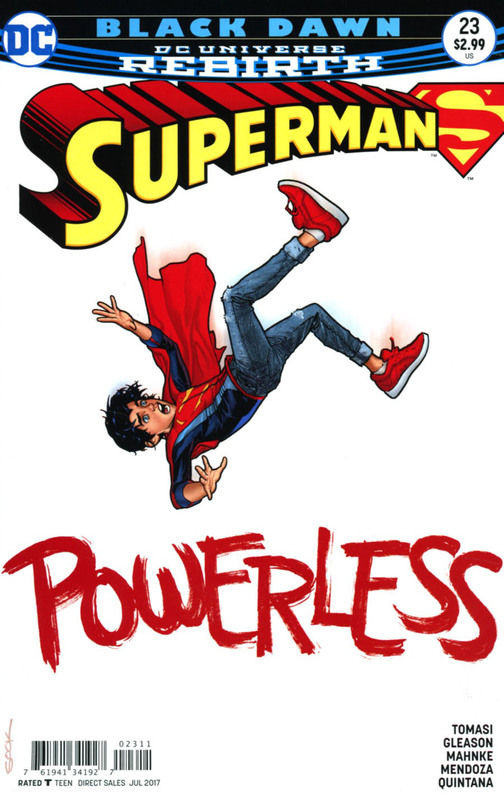 Each of the townsfolk then begin to take on their true form and reveal to Superman that they've been leading Jon down a path that they have been orchestrating to ensure he will succeed where Superman has failed. They are the Super Elite and they waste no time in brutally wounding Lois. Superman swears to find Jon but what he doesn't know is John's captor, and mastermind to all of this, is none other than Manchester Black! Well, Gleason and Tomasi promised us that Black Dawn would not only reveal the truth about Hamilton County but also put Jon in a scenario that could change him forever. They did not disappoint. I avoided the spoilers and enjoyed the story for what it was, that of course is brilliant. The Super Elite I was expecting but the villain Manchester Black, I was not. Of course as a corrupting influence he is a perfect tutor but I have grown to really love Jon and hope that this doesn't send him in the direction Supergirl and Superboy were sent during the New 52 days. Some of the darkest times in Superman's career are courtesy of Manchester so I am of course expecting to be shocked to the very core by the time Black Dawn ends - and if everyone makes it out alive. Art - 5: Though Lois, Clark and Jon spend most of their time apart this issue, they've never been more together as a family... especially in the art department. Each family member was given a scene to shine in and Jon's heartbreaking scenes watching his mother in horrific pain brought it home. I felt every emotion just as they did and that says a lot about the book. Cover Art - 4: Perhaps out of sync with the issue itself, the cover art is still really nicely rendered. I love the color palette and style. I could have done without 'Powerless' emblazoned across the bottom, but it still hit all the right beats with me. Perhaps the Super Elite should have been featured? Variant Cover Art - 5: This. Is. Amazing! I love it, the iconic feel of the art and the hint of black and white perhaps hinting at Manchester? This is a cover that speaks volumes.